Enjoy your own luxurious, wood-floored tree house after just two days of construction, and when you’re ready to tear it down, it leaves no trace on the trees or the ground. 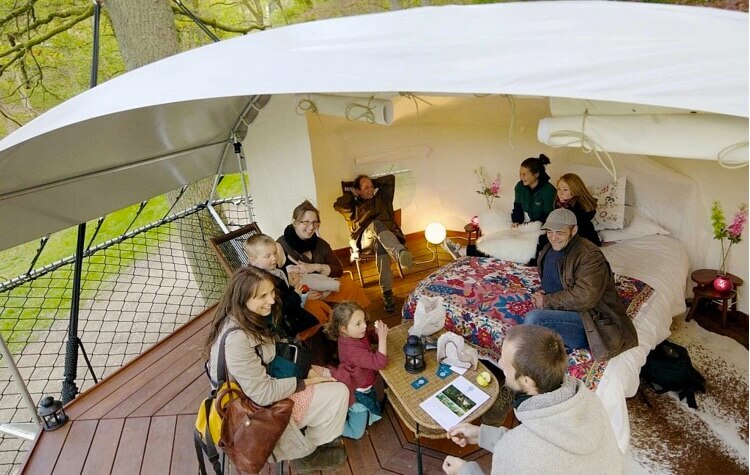 The Dom’Up by Belgian company Trees and People encourages spending time in nature without sacrificing comfort or having a negative impact on your chosen location, for a ‘glamping’ experience in the treetops. 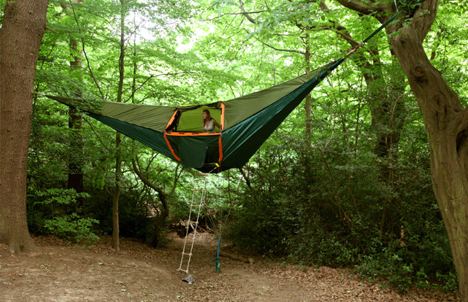 An octagonal structure suspended between two or more trees, the Dom’Up starts as a kit that you assemble piece-by-piece for improved portability. 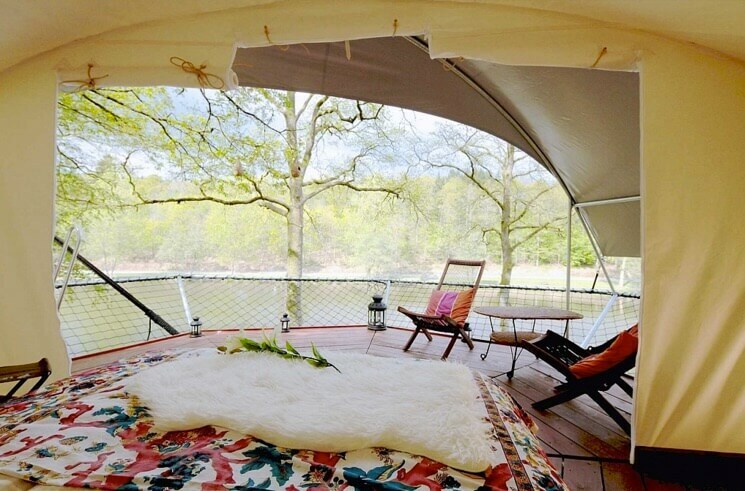 A galvanized steel base supports the dark-stained timber flooring, with netting acting as a safety barrier without obscuring the 360-degree-view of your natural surroundings. 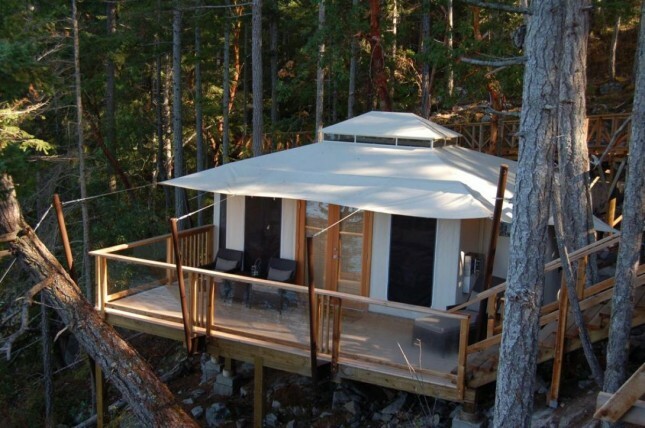 A taut white roof made of water-resistant thermo-welded tarps shelters the interior from rain and wind, and tent walls roll down to provide a private space within, with a deck area remaining exposed to the elements. 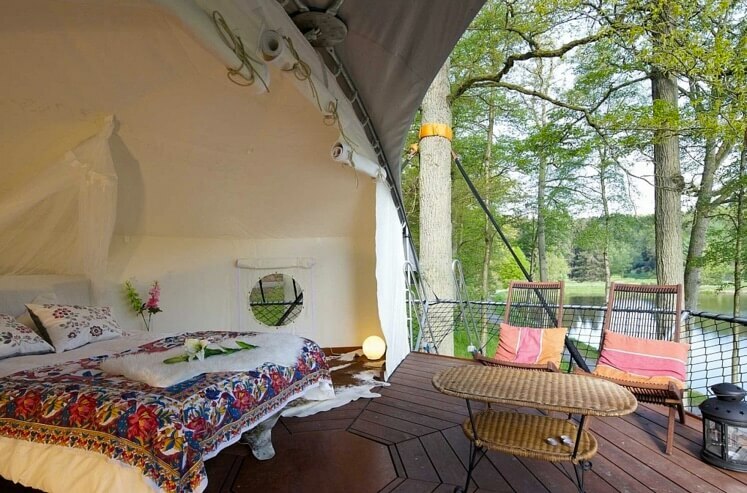 The platform is large enough to support a real bed and other furniture. 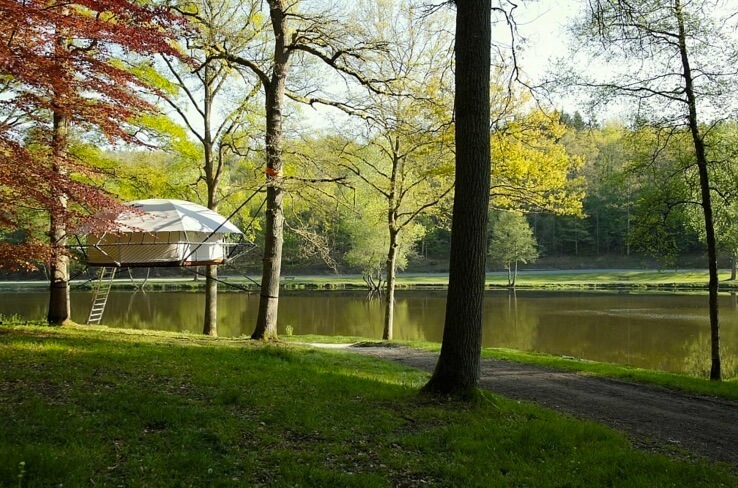 Once installed, the floating tent can stay in place for up to three years without damaging the trees. Move it to a new location after that time and it’ll last another seven years, with the straps and ropes requiring replacement a little more frequently. The unit is surprisingly light in weight given how strong and durable it is, with a sturdy steel ladder enabling easy access up and down. 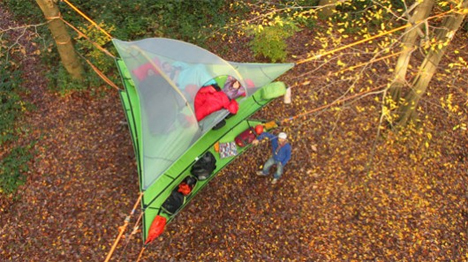 The footprint of the tent itself is about 16 square meters (172.2 feet). 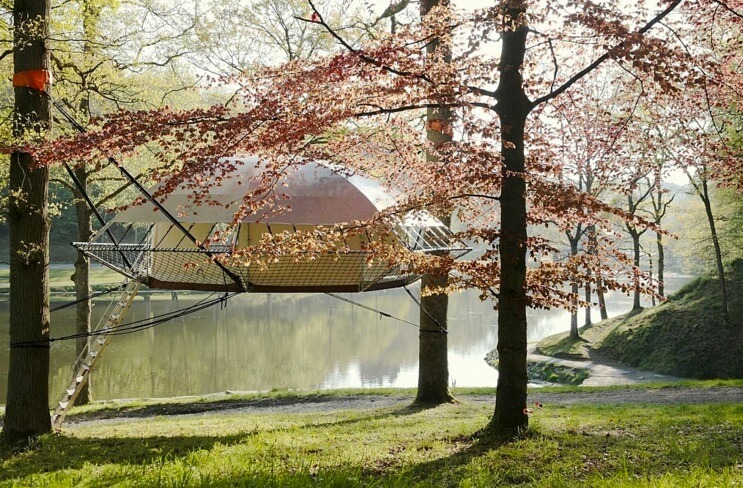 The Dutch arboriculturist Bruno de Grunne, who worked on the project along with architect Nicolas d’Ursel, spent years studying ways to attach the supports to trees without harming them. While not exactly cheap at $28,215, it would make a cool semi-permanent backyard addition or off-grid structure for a remote property. 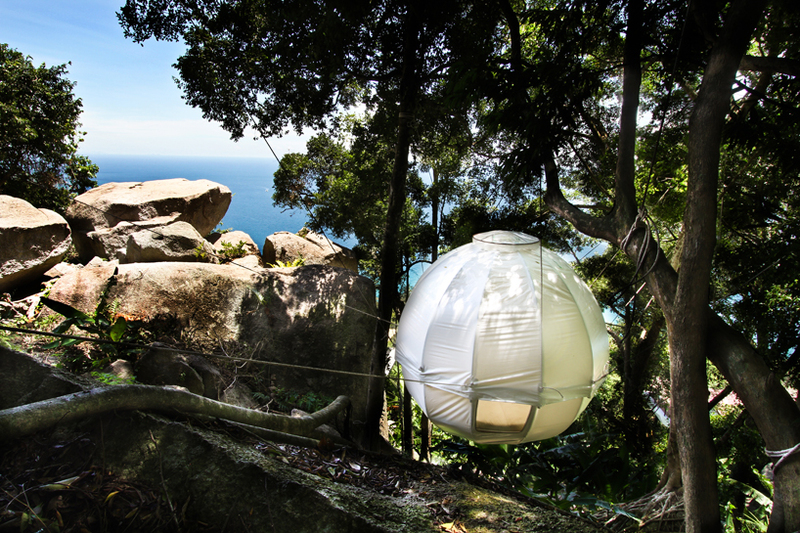 Options like the Cocoon Tree Bed (above) may be more temporary, but they’re just as beautiful, offering a similar experience on a smaller scale. 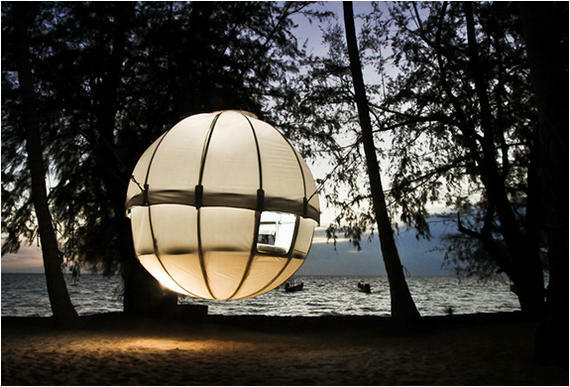 The Cocoon Tree comes with a bed large enough to support two adults and two children, and is accessible either via nets or wooden walkways once set up.